Dairy Farmers of Canada’s Cheese of the Month Club continues today with some awesome #CanadianCheese hailing from Oxford County, Ontario! 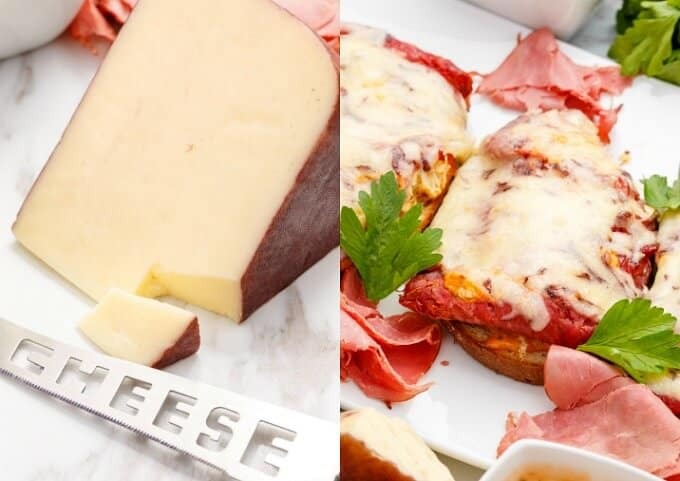 These open-faced Reuben sandwiches utilize Tipsy, an amazing Canadian cheese soaked in wine for several days, making it the ideal melting cheese for today’s recipe! Look at that colour! Dairy Farmers of Canada‘s Canadian cheese selection is another winner! To be honest, when I first unraveled this cheese my mind went blank. I didn’t know what to make! The colour is beautiful and I definitely did not want to mask that. Sometimes simpler is better, and since Tipsy is modeled after a little known Swiss cheese called Mutchli, I decided to stick to more traditional routes! A mild creamy cheese that is lightly lactic and buttery in flavour, Tipsy is delicately aged on cedar wood planks (only adding to the flavour!) 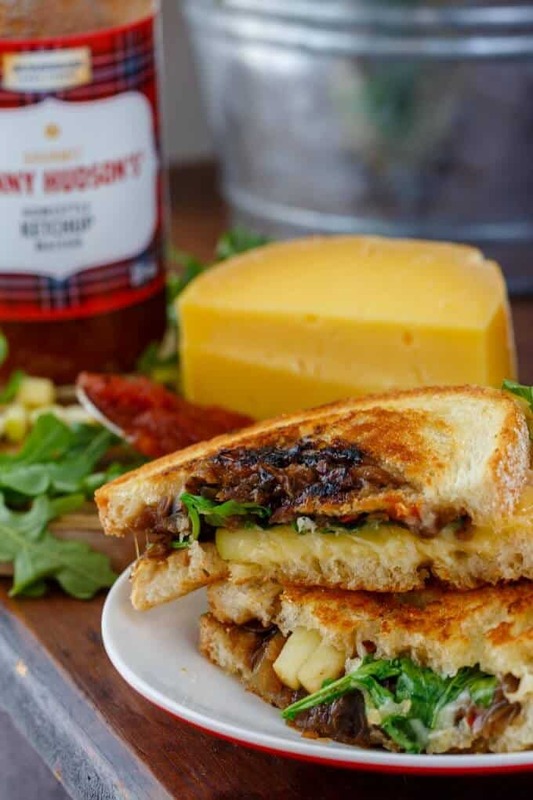 My daughter (who is now 4 for 4 with our Canadian Cheese of the Month Club) said the mellow flavours reminded her of bread, haha. I was so enamored on my first bite, expecting a really strong wine flavour but rewarded with a soft, mellow taste. I don’t know if I would use the word “bread” to describe the flavour, but there is something truly unique about the taste that had me going back for more and more! After realizing the wine flavour of Tipsy is nowhere close to what I was expecting, my mind immediately went to traditional Swiss cheese recipes. Tipsy’s creator, Shep, at Gunn’s Hill Artisan Cheese shows Swiss influence in his award-winning cheeses with techniques learned while making cheese in the town of Handeck, in the Swiss Alps. These influences can be seen/tasted in the production of some of Canada’s finest award-winning cheese, all of which are handcrafted, using traditional cheese making methods at Gunn’s Hill. I just love it! While I LOVE cooking with wine, I am not a wine drinker. This only produced more anxiety when coming up with a recipe! However, I must say again, the perfect balance of wine and natural cheese taste comes out here! I will forever have this cheese as a member of our household, especially when serving to wine-loving guests 🙂 The great part is that Tipsy is even rewarding for the non-wine lovers (like myself!) Win-win all around! 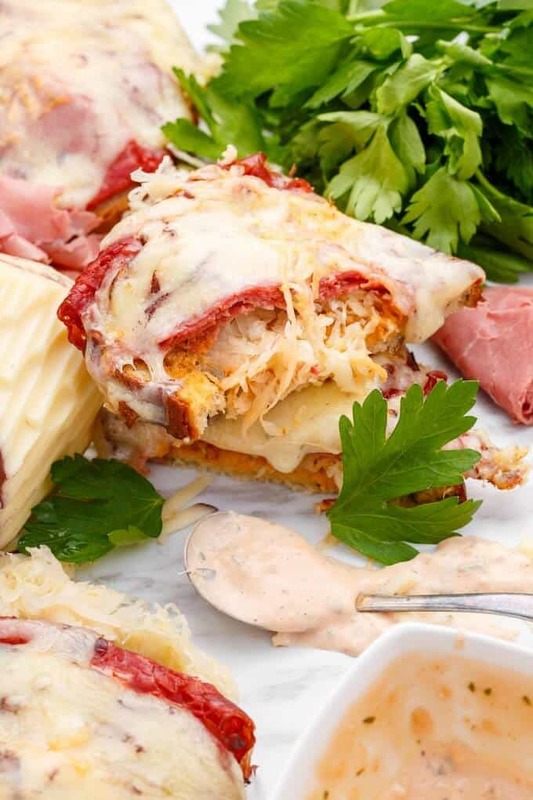 For these open-faced Reuben sandwiches themselves, measuring of ingredients isn’t too important. Add as much meat and sauerkraut as you seen fit, and then top with copious amounts of Tipsy cheese! Trust me, not overwhelming at all and the star of the show! You can also forgo the homemade Russian dressing and buy a store-bought variety (or Thousand Island Dressing) but I think my recipe is darn good! And fear not! 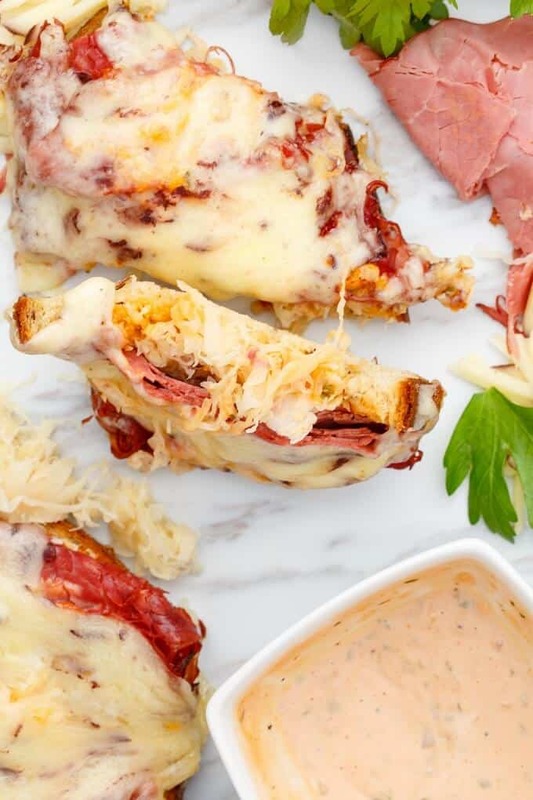 These open-faced Reuben sandwiches can be cooked in the oven, on the stove top, or even on the BBQ! Summer picnics here we come! Reuben sandwiches are generally served with Russian Dressing. You can always use Thousand Island dressing in place if Russian dressing is not common at your store. To make the dressing, combine all the ingredients in a mixing bowl. Mix until well blended, adding more acidity (lemon) or spicy (dash of hot sauce) if desired. Chill. Preheat oven to 400F. Place bread slices into a shallow baking dish. Grease one side of each slice with butter and place butter-side down. Top with 1-2 tbsp. Russian dressing, sauerkraut, corned beef, more dressing if desired, and lastly, Tipsy cheese! 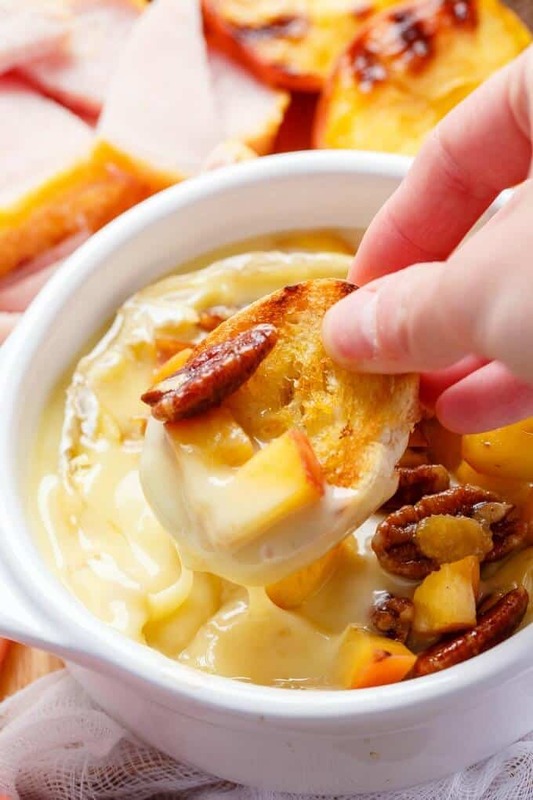 Place into oven and bake for 10 minutes, or until cheese is bubbly and melted! Remove and serve immediately with extra dressing if desired! Use deli-style corned beef for a quick and easy sandwich! Don't worry about measuring out all the toppings: add as much or as little as you like! Oh myyyy. I love Reubens ! Something about the meat and sauerkraut is homey and satisfying ot dig into. 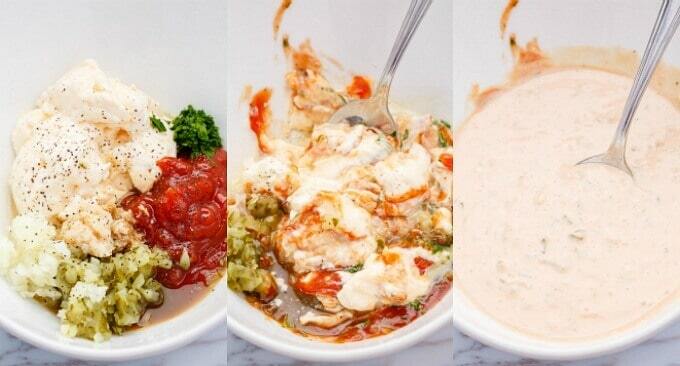 Add that winning combo to Tipsy cheese and that is one heck of a killer trio! Growing-up on summer vacations when it was rainier and cooler my mom would make open faced ham + cheese sandwiches in the oven for us as a treat and I think I just have to revisit that tradition with this more refined, adult approved, sandwich!